Lum & Abner are facing off against Squire Skimp, and find themselves in a bit of legal hot water. Lum considers several changes of profession�and Abner aims to take over the Jot 'Em Down Store on his own. 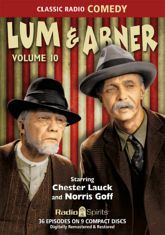 Come listen to Chester Lauck and Norris Goff in 36 consecutive episodes from the winter of 1943 - 1944 and find out!